Jennie Denise Crawford, 58, of Springfield, Virginia passed away at 4:19 a.m. on Saturday, January 26, 2019 at Walter Reed National Military Medical Center in Bethesda, Maryland. Jennie was born December 29, 1960, in Missouri, the daughter of Girgis Mikhail and Leona Durbin. 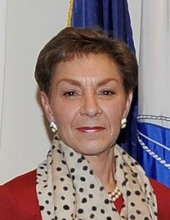 In October 1981 she joined the United States Army, serving on active duty until May 1988 and continued in the individual ready reserve until 2005, being recalled for events such as Operation Iraqi Freedom. Jennie was married to Col (Ret) David Crawford on August 8th, 1987 in Phoenix, AZ. Together with their two children, they served at military posts and diplomatic assignments in the United States and in a myriad of countries around the world. She was a beloved wife, mother, daughter, sister, aunt and friend. Jennie is survived by her husband, David; daughter, Amy; son, Matthew; parents, George and Leona (Mikhail); sisters, Karen (Greg) Rogers and Trudy (Kevin) Shady and brother, Peter (Julie) Mikhail. Funeral services will be held at 2:00 p.m. on Saturday, February 2, 2019 at Lockart-Green Funeral Home in Beecher City. The service will be officiated by Chaplain (COL Ret) Scotty Lloyd. Burial will take place in Oak Grove Cemetery in rural Cowden. Visitation will be from 1:00 p.m. until the time of service at Lockart-Green Funeral Home in Beecher City. In lieu of flowers, memorials may be made in Jennie's name to the Wounded Warrior Project, P.O. Box 758516, Topeka, KS 66675-8516. Family and friends are invited to light a candle or share a story in Jennie’s honor at www.lockartgreenfuneralhome.com. To send flowers or a remembrance gift to the family of Jennie Denise Crawford, please visit our Tribute Store. "Email Address" would like to share the life celebration of Jennie Denise Crawford. Click on the "link" to go to share a favorite memory or leave a condolence message for the family.